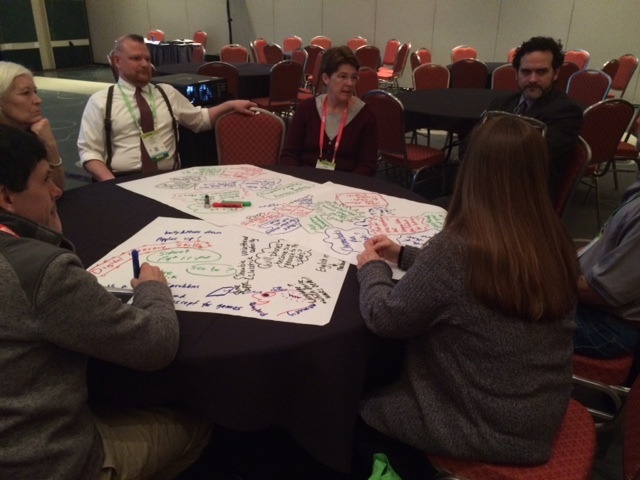 Previous PostAffirmation Through Absence: Thoughts on #NAISAC 2015Next PostThe Inaugural NAISAC Interactive Maker Space- Fun For All! This issue resonates with me for a few reasons. First, I have found these kinds of peer discussions at other conferences/gatherings to be incredibly valuable and, often, the *most* valuable aspect of those conferences. Second, I wish these opportunitites existed at NAIS and did not realize that they did, and last, I agree that the name is a big factor in my not realizing. Would “Teachers’ Roundtable” and “Administrators’ Roundtable” work? That seems to be what they are…roundtable discussions. I hope you are successful in sustaining the opportunity. Don’t lose sight of the fact that even if 30 was a low turnout it was certainly worth it for those 30. Thanks so much for your thoughts! I like the idea of using the term “roundtable” rather than “unplugged.” I really do believe with a better title we can get more people. I also recognize that it doesn’t matter how many people there are (in fact sometimes smaller is better). But I worry that NAIS might not continue to see it that way. These sessions are so wonderful, and the attendees always rave about them. I agree with the idea about possibly changing the name. That may help. 1)	Create a video, like this edcamp video (i.e. https://www.youtube.com/watch?v=j7kBnudi_8I) so everyone can see how it works. Maybe this could be shown at the opening session? 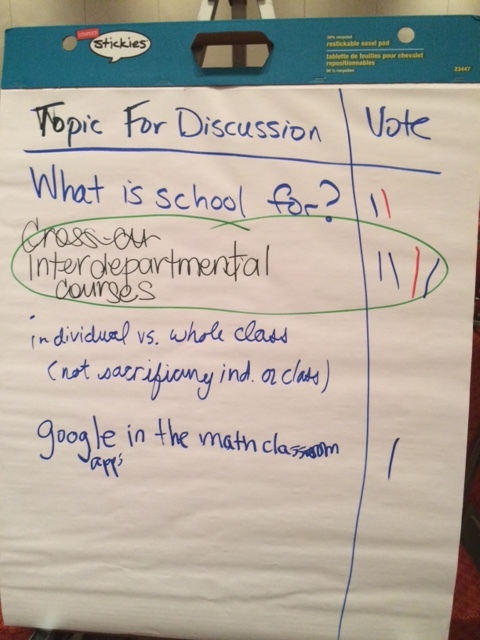 2)	Encourage the rule of ‘two feet’ as modeled at edcamps. I have to admit, I don’t feel comfortable leaving a session when I find it doesn’t meet my needs because I don’t want to offend the presenter. However, if we want to get the most out of the time and resources provided by our schools, this should be encouraged and valued. 3)	It might be an effective model to have a ‘roundtable’ room available all day long. Then, anytime throughout the day, if a session does not meet your needs, you have a place to go where you can comfortably ‘drop in’ and ‘drop out’ and still learn! 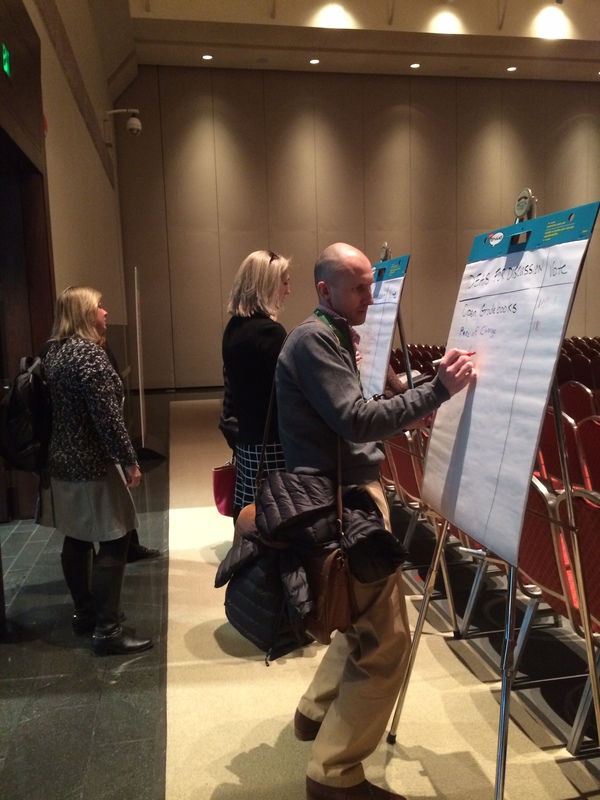 4)	Share some quotes from past attendees to help explain why they liked it so much. 5)	Share some of the topics discussed in previous years, as examples, while making it clear that the participants of THIS event will determine the topics for THIS year. 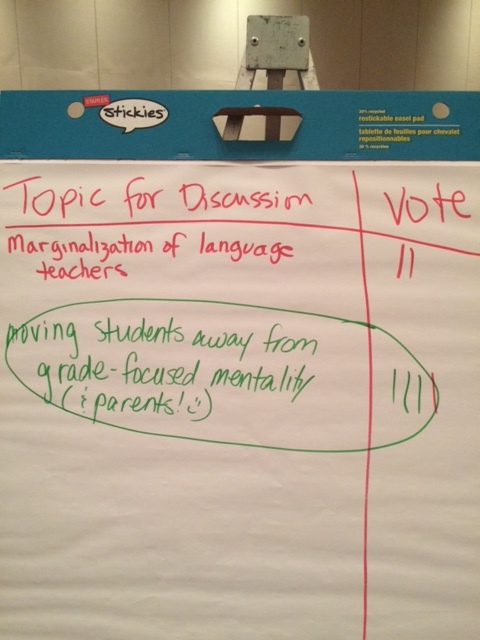 6)	Ask attendees prior to the conference if there are any burning topics not covered anywhere in the program. These possible topics could be shared to encourage participation. 7)	Advertise a giveaway for people who bring a friend or come in groups. Great questions, Liz! I look forward to hearing many ideas.